In December I had a chance few in my industry get – to draw a cartoon for Australia’s pre-eminent daily newspaper, The Age. It came about because one of the paper’s most respected cartoonists had taken up my cause, championing my work to the editors. With things quiet over Christmas, my opportunity came – would I like to illustrate a Sunday column by one of the paper’s stalwarts, John Elder? I had two days to turn it around, and they expected some sort of montage – after all, how could such disparate stories fit into one image? 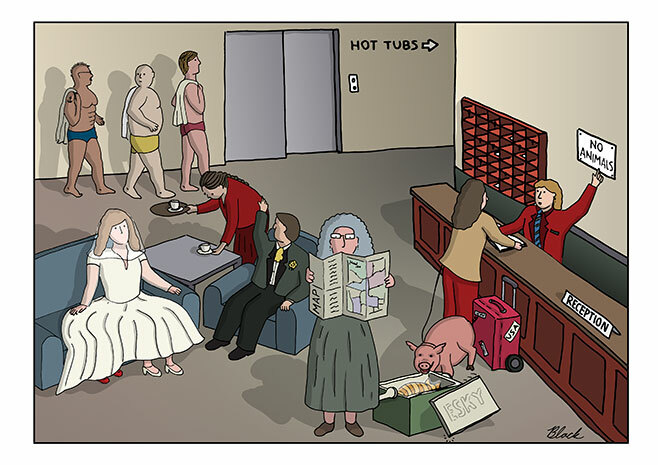 But it occurred to me that there was one place they might all cross paths in their stories: a hotel lobby. So that’s what I drew, from the kitchen table of our rented holiday house on Christmas night. They even used it as the poster outside newsagents around Melbourne. You can read the full article here. Finalist at the 2017 Stanleys! Finalist at the 2016 Stanleys! Finalist at the 2015 Stanleys!